Yesterday morning I met with UMW Computer Science professors Karen Anewalt and Stephen Davies to discuss possible platforms for an online course they are offering high school students in Virginia. In particular, they were wondering about the open source platform EdX runs on. I had no experience with the platform, and told them I’d take a look at what was involved in setting up a sandbox. I have to admit I wasn’t so sure I would be able to do this easily, which is probably the feeling that drives most EdTech shops to say no to stuff like this out-of-hand. At the same time, DTLT has always had success remaining open to alternatives (not to mention it makes what we do fun). In fact, it’s kinda who we are; our narrative is based on the idea there’s more in heaven and earth, Horatio, than you can dream of in the learning management system. So, even if we couldn’t get an instance of EdX software up and running in our externally hosted LAMP environment, I was pretty sure I could reach out to my network and find someone who had an instance up and running that we could get access to. Turns out I didn’t have to go either route because I work with Timmmmy Wonder. 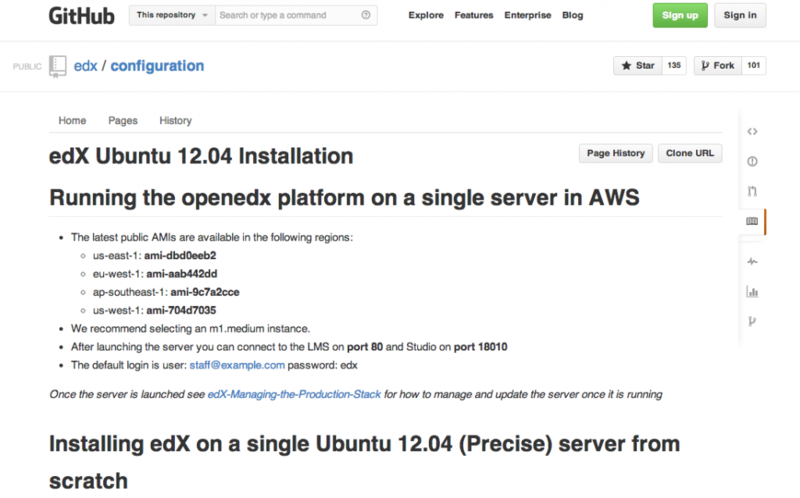 I consulted with Tim about EdX and he checked out their GitHub configuration page and realized there was an instance of EdX available as a community AMI ( or Amazon Machine Image) on the Amazon cloud service EC2. Within minutes Tim configured and installed a test instance of EdX’s open source platform and mapped it onto a domain that our faculty could access within half-an-hour of our meeting. Wow, I thought script installers for web hosting were easy eight years ago. So, we’ll run that instance for a few days and let the faculty explore the application. When they’re done we’ll shut it down—all at the price of a few dollars. How crazy is that? It works equally well for DTLT, UMW’s IT department, and the faculty because we can all get a sense of this application without dedicating too much time to a pilot install. 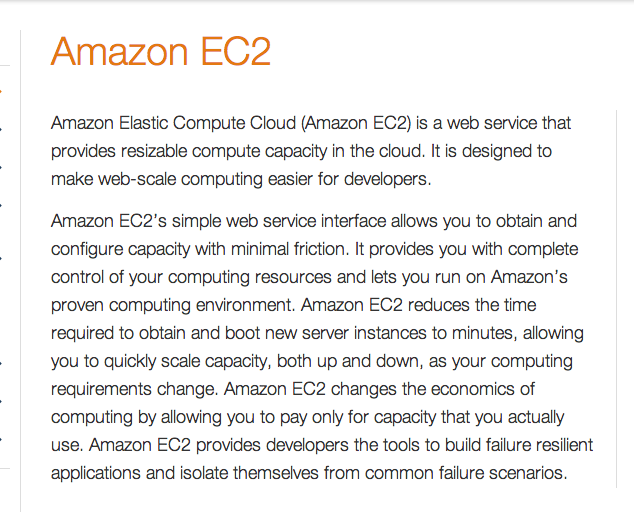 That may ultimately happen if there’s interest, but for the time being an instance on Amazon EC2 is more than enough. That’s agile EdTech. Don’t default to no when faculty come to you with alternatives. Provide quick and cheap possibilities to explore what’s available. Spend more time talking about how they’ll use it rather then worrying about the technical requirements. That will all come in time if the application makes sense for what they are trying to do. I am amazed how much this process seems like the next level of the web hosting experiment DTLT did back in 2004/2005. This entry was posted in experimenting, Instructional Technology and tagged amazon ec2, edtech, edx. Bookmark the permalink. I’ve tried saying this to our IT department. Amazon and so on make you obsolete. A large central VLE/LMS makes no sense anymore, it’s a tower block (project in the US? Maybe tenement) where everyone lives on each other’s toes rather than standing on each other’s shoulders. We’ve got 4 pilots now running on clouds, because why bother with your own stuff. Have a look at heroku too – easy peasy cloud stuff. I can see a model with a smaller VLE/LMS, and everyone playing on clouds instead. Our IT department is comfortable with us hosting externally, in fact Domain of One’s Own and UMW Blogs are both hosted on dedicated servers by other companies. IT prefers it. The issue is actually more with purchasing. We have to resolve how we can use cloud computing and pay for it when the cost could be $20 one month and $200 the next. Difficult for them to wrap their heads around and for a state agency to understand what “good” is being purchased (though that was a battle we fought to become a domain reseller too). We’re definitely working hard to be as agile as possible while still being required to follow agency guidelines that haven’t kept up with modern computing at all. Purchasing is a red herring (too english) – because you’re not purchasing anything, you’re paying for demand. You could argue we buy 1 book for library and people need to wait, but that seems a weird thing for a modern uni to do. Good point, we pay for access to virtual books for the library, the only difference is it is a fixed cost. I wonder if we couldn’t set up something like we have access to X amount of Amazon EC2 bandwidth over the next year. We are going to have to do something like this is we start bringing Amazon S3 into the Domain of One’s own conversation, which I thinkw e should. Absolutely, I couldn’t agree more. And you (and >Scott Leslie on Twitter) spelt out something that is just dawning on me, why can’t we imagine this as an alternative to the one size fits all. I’m sure folks already do this for highend research computing, but what about one off teaching and learning experiments? I love this line of reasoning. We will chekc out heroku, and thank you for being Old Gold in the comments, I’m a big fan! Heroku is a sort of build a little app quickly – a sort of wordpress.com for cloud apps. Techie, but give it a few years. The spirit behind the WordPress as LMS project was use a reliable code base, but then give people 20,000 plugins and 10,000 themes to pick from. No LMS comes close. I just finished EdX training to help design a MOOC for George Siemens (because I guess UTA decided to suddenly pay attention to the Ed Tech world). It felt like I was back in the 1990s. Not the good or bad part, just the blah parts. I kept thinking “Wow, SoftChalk did that in 1996” or “Wow, WordPress has been better at that since at least ’97.” Total behaviorist stimulus and response knowledge transfer, no connecting or constructivism or any of that good stuff. When I first saw the Coursera back end, I was shocked but how thin it was. I don’t know, the video player was pretty decent with its support for transcriptions that allow users to skip through the video based on the text. While I’m sure the content editor stuff isn’t all that compelling, I think if the goal is to run a schedule online course open to registration this platform would be a hell of a lot better than attempting to build it all in WordPress (I love WordPress but it’s a square peg in a round hole when it comes to some of this stuff, you have to have a high level of support and knowledge to pull together the necessary plugins that enable the same stuff). Did you see my WordPress as an LMS plugin? I did and I think it’s great people are using WordPress as an application platform to build that kind of stuff. There’s also Sensei. I’m not arguing at all that it’s not *possible* to do anything and everything in WordPress, it’s a great platform for emerging possibilities (versus something like EdX which has a single purpose). But I hate when people hold WordPress up as a gold standard when many times what faculty want is not a huge toolbox, they want the finished product that is going to meet the need they had. Especially faculty who don’t have a great instructional tech staff to support them in this. Number of times I build something and someone says “can you make it as a WordPress plugin” and I just go yes, let us make everything in WordPress and put all our eggs in one basket. However, given this is agile ed tech there is an argument for it as agile framework? I can’t think of a quicker one. Maybe a case for building a super lite login / content control platform. Yeah, the video thing was nice, but its still just basic SRT technology that is not really new. For a company that uses the word “innovative” and “interactive” every other word, I was surprised to find very like interaction (dragging a dot on an image is not really interactive) and very little innovation. The whole EdX platform creates a very high transactional distance, which means you would then need very, very independent learners to be successful, which very few people are THAT independent. Just seems like the same ol’ LMS idea pre-packaged.